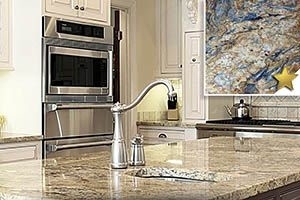 Granite is an extremely popular choice for kitchen countertops. It is no wonder, as granite is distinctive and beautiful as well as highly functional. However, if you want to make a splash with your own kitchen, you may want to make a bolder choice. The most common granite colors for kitchen countertops are the easily identifiable streaked grays and browns, which are relatively neutral and blends well with any kitchen design. You can go a different route and choose one of these colors to make your kitchen counters, and your kitchen, look awesome. Baltic blue granite is a stunning piece of stone from Finland that has a vibrant blue background and uneven brown circles. You will find varying shades of Baltic Blue granite, from quite light to very dark. It is available in polished finish, but it looks best with a honed finish as it brings out the stylishness of the stone. It goes with almost any kitchen style, from traditional to modern, and it serves as a perfect transitional element for color coordination. Using it for a kitchen countertop guarantees it will become the center of attention. Because it is granite, it will also stand up very well for outdoor kitchen countertops or worktops in the barbeque area. If you want dramatic flair in your kitchen, you should consider Cosmic Black granite for your kitchen countertops. These natural stones are beautiful in shades of black with intermittent amber, white, and burgundy streaks. Found mostly in Spain, Brazil, South Africa, and Italy, this phyllite rock is also known as Saturnia and Asterix. You will find a wide range of minerals and pockets of quartz in it, which makes it truly cosmic. It is ideal for kitchen countertops, but also work well for fireplace surrounds, vanity tops, and floor tiles. No two slabs of Cosmic Black granite will be exactly alike, but the dark colors make it easy to join them seamlessly. Cosmic Black is dramatic yet subtle, and perfectly complements many fixtures and appliances, which make it ideal for use in kitchens. Golden Arctic granite, also known as Arctic Gold, is a white granite with large crystals of amber, black, and brown sourced mainly from Brazil. The rich colors of this granite make it suitable for indoor and outdoor use, but in the kitchen, it is a ray of sunshine. Use it for kitchen countertops as the centerpiece for traditional and contemporary kitchens, and match it perfectly with any material, from wood to metal. You can order it in polished and honed finish for your countertops, and have it sanded, rock faced, or sandblasted for outdoor use. It is granite, so it will last for a very long time. Giallo Matisse, also known as Amarelo Matisse and Golden Matisse, is a yellow granite from Brazil with large grey veins and swirls that makes it seem as if it is moving. The swirl and vein patterns will vary greatly from slab to slab, but it will always be a striking feature in any kitchen or bathroom. The predominance of yellow may limit your choices in color, but it will go well with any type of kitchen and bathroom design. Still on the lighter side of stunning, Golden Silver granite, also known as Silver Gold and Gold and Silver granite, is yellow granite shot with grey and white sourced from Brazil. In some slabs, the white may seem predominant, but it is not white granite. Its neutral tones may seem a contradiction of drama, but the vibrant colors of the stone elevates it to subtly elegant. It is ideal for kitchen islands, bars, and perimeter counters. and the look can be enhanced with under cabinet or spot lighting to pick up the gold and silver tones. It will go equally well with a vintage chandelier or ultra-modern pendant lights. The striations in the stone also make it easier for experts to fabricate and install for a seamless look. These are just a few of the more dramatic colors available for granite countertops. Any one of these and few more will make your kitchen remodeling a big success. However, it should be noted that the color and patterns you may see in photos might not be an accurate representation of the actual slabs available in our showroom. Natural stones are notoriously inconsistent in this aspect, so it is best to check the actual stones before purchasing. We cannot assure you that the granite color you choose will be available because the supply depends on what is currently available from our partner quarries. However, we can assure you that you will find similar ones in our stock, and they will be of the finest quality. KNC Granite has a large array of granite slabs from which to choose. You can check actual slabs at our showroom in Lanham, Maryland. Aside from natural stones, we carry some of the top brands of engineered stone. Including Cambria, Caesarstone, Silestone, and MSI, all of which come with manufacturer warranties. Give us a call or email us for your free in-home consultation and quote.